We're traveling until April 2016. We'll post pictures and impressions here. Check back regularly and share your thoughts! As we enter our fourth week in the tropics, we’ve reflected a little bit on the most effective coping mechanisms we’ve come up with to manage our northern nature in Cambodia’s tropical climate. Slow Down: We’ve come to realize that we’re happier when we do less. While historically true Vikings both pillaged and plundered, we’re quite content to simply plunder; plunder the inside of our freezer, that is. Consume Flavorful Ice Cubes Throughout the Day: We’ve been making ice cubes out of various liquids, including coconut milk, apple juice, mango juice and have taken ‘iced coffee’ to a new level by freezing coffee with milk and sugar into ice cubes (Ida and Saga’s favorite ice cubes at the moment). We’re popping ice cubes all day long. Freeze Any Fruit That Lends Itself to Being Frozen: So far, we’ve been cutting up and freezing bananas and mangos and are tempted to test the limits of what fruit tastes good in frozen form (green apples? rambutans? durian?). Double/Triple Up on Fans: As soon as the sun rises, we re-position our three floor fans from our sleeping quarters to our living quarters. The fans are absolutely critical to keeping our (delicate?) northern blood at a reasonable temperature. (The other day when the power went out at the hottest time of day, Les Manguiers staff casually asked if we actually needed electricity. They then saw the desperate look in our eyes – our lifeline to cooling down! – and moved quickly to have the power restored). Nigel and I have been brainstorming about ways to replenish and re-hydrate after our occasional morning runs (as far as addictions go, we’re only moderately addicted to this type of exercise and satisfy our urge every now and then). So far, we’ve come up with a potential running route that would take us past some local salt flats (a simple lick should replenish our salt levels) and get us home before the morning dew has evaporated (a quick “snow/dew angel” should be rather refreshing). Now that the Kampot River has regained its reputation has a safe watering hole, we’re also back to taking regular dips to cool off. And this is by far the most pleasurable way for us modern Vikings to enjoy these magical surroundings. 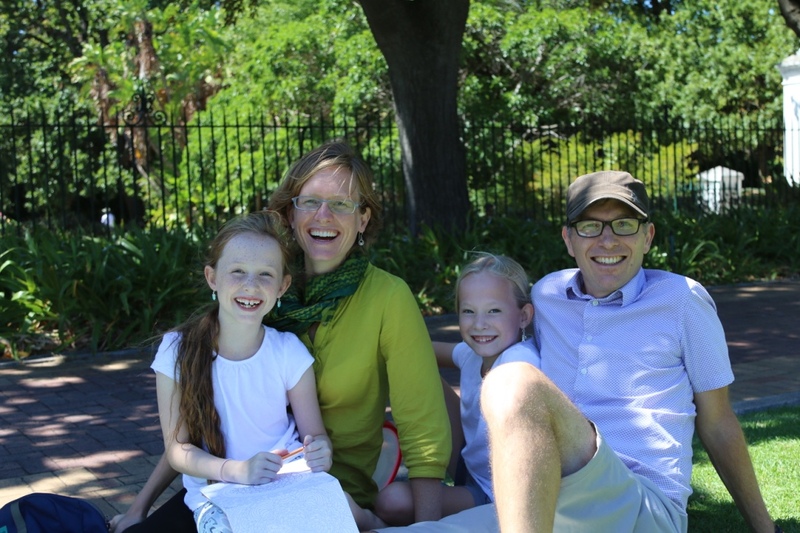 Hi Nigel and Louisa (and girls) – loving the writing and pictures. Keep it up. Sounds like “good fun” is being had by all :o) We’ll forward pictures of snow soon enough to keep you cool! My only experience with heat with no AC (and not nearly this hot, I’m sure) was at Grad school when it stayed 30 C overnight for a couple of days… I highly recommend getting a towel damp, spreading it over yourself and then positioning a fan so its blowing towards you. The cooling from the evaporation helps a little. To that end, the girls might find that wet hair or a wet bandana over their hair (cause scalp burns are the WORST!) might feel nice.